Gaga goo goo? Just when we thought that Lady Gaga couldn't get any zanier, the 25 year old chanteuse showcased her new line of babywear consisting of mini versions of her most famous getups. If you're hoping this is a joke, you're in luck. 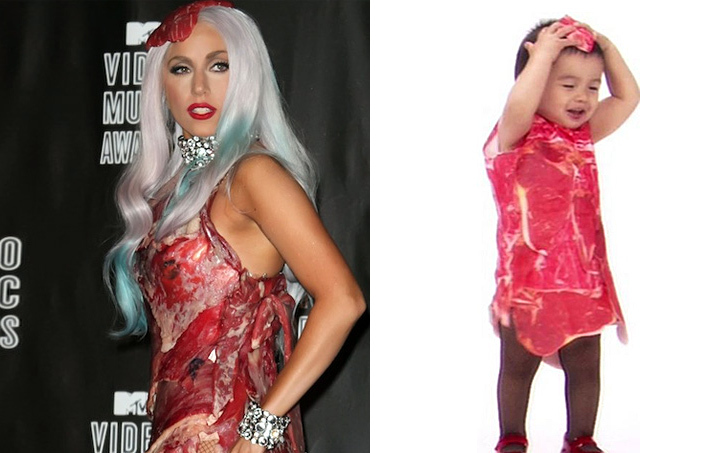 The line, called Gaga Goo Goo, was actually a spoof for her appearance on the Jimmy Kimmel Show, where a video showing the outfits - like a pint-sized version of the infamous meat dress - debuted. Check out the video after the jump to see all of the looks. Lady Gaga entertained the Jimmy Kimmel audience with insane baby versions of all of her most outlandish costumes, including a hilarious toddler take on the infamous meat dress. Other Gaga ensembles spoofed into toddler wear include her bubble dress and Kermit dress, which actually looked pretty adorable on their miniature models. What do you think about these little monster outfits? Let us know in the comments.